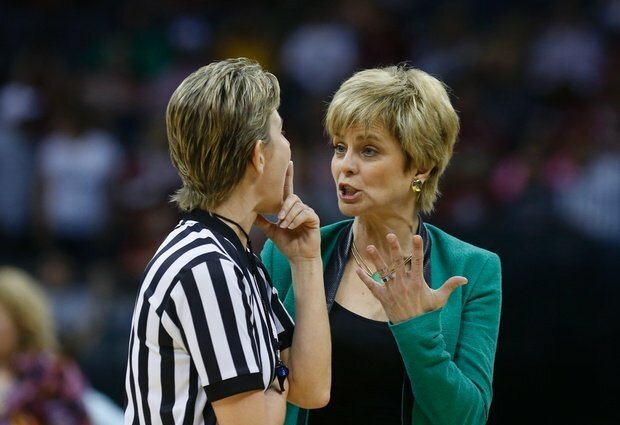 Baylor’s women basketball coach, Kim Mulkey, has been suspended for the first game of the program’s next NCAA tournament. The suspension comes as a result of Mulkey’s criticism of the officiating in the Baylor vs. Louisville game, which ended the college career of WNBA’s #1 pick Brittany Griner. The Baylor Bears had not lost a game in a long time and saw their 32-game win streak broke. So, of course Mulkey would be HOT, literally. Watch the video, she tries to rip off her jacket. Do you agree with Mulkey’s suspension? Bobby Knight used to throw chairs….all she did was yell and try unsuccessfully to rip off her nice Kelly green jacket!